Between Space Cadets: Dice Duel, The Dragon & Flagon, and this year’s The Expanse — which even made the book series’ stupid James Holden a little more appealing — you’d think I would have learned to trust Geoff Engelstein. And yet The Fog of War sat on my shelf for months before I finally got around to figuring out how to play the dang thing. Part of this is the game’s fault. To put matters bluntly, its rulebook is about as coherent as roadkill outside Las Vegas in late July. Worse, in between learning a handful of legitimately complex games this year, I bounced off The Fog of War’s puzzling array of new concepts, out-of-place rulings, and ponderous layout on more than one occasion. Okay, enough harping about the manual, because here’s the thing. Now that I’ve learned The Fog of War, I’m smitten. This one of the smartest, most devious, and absolutely gut-wrenching game systems I’ve ever had the pleasure to interact with. Ever since its release two years ago, Dark Moon has ranked as one of my preferred traitor games. Between its in-your-face brand of manipulation and the grungy utility of its visuals, it offered an oppressively claustrophobic take on the classic tale of a crew torn apart by an invisible insider. Shadow Corporation is one of those expansions that might not seem necessary at first glance, especially because Dark Moon was as perfect as a curly-haired baby. But now that it’s here, I can’t fathom playing without it. Dutch knew it while deep in the jungles of Val Verde in Predator. Ellen Ripley knew it down on LV-426 in Aliens. And most importantly, Richard B. Riddick knew it in sci-fi classic Pitch Black, and also in Riddick, which had the same plot. Being stranded in a remote location teeming with alien life blows. At long last, Dan Thurot and Brock Poulsen debate the merits of Terraforming Mars, the game that took Argyre Planitia by storm. Is it good? Bad? Will it float? These are the questions that keep philosophers awake at night. There’s something about throwing a hefty mug, beverage still sloshing around inside it, at a friend’s head. If you haven’t managed to scratch that one off the old bucket list, I recommend getting to it sooner rather than later. Live a little. In the meantime, The Dragon & Flagon is all about tender moments like these. A bunch of adventurers, rowdy and randy after their latest successful dungeon dive, and all as parched as that heap of desiccated bones they kept tripping over, have decided to trash the tavern they’re supping at. Who can blame them? They just saved the village. Maybe. After knocking a couple back, they can’t quite remember. The entire span of human civilization is a lot to compress into three or four hours, let alone a trim 90 minutes. And yet that’s precisely what The Golden Ages aims to accomplish, cheerfully charting mankind’s ascent from mudbrick ziggurats to skyscrapers to star ladders. Better yet, in an age when a game’s briskness is often valued over its cleverness, all too often leaving the possibility of deep gameplay experiences stranded along the side of the road in its haste to arrive at its destination, The Golden Ages manages to be something even more valuable than fast: compelling. Dark Moon will never entirely escape its association with Battlestar Galactica — fair enough, considering it’s a retouched version of the print-and-play game BSG Express. Out with the Cylons and space-jet dogfights, in with the alien parasites and handfuls of dice. Every so often I come across a game that fills me with more a feeling of respect than love, or even of enjoyment. It’s like that one time I met myself from the future, after I’d sacrificed countless human and alien lives to end the Hydrangine Wars — don’t worry about it, you’ll find out about those soon enough — and I found my usual narcissism replaced with something a touch more distant, more like the relationship I might have with a teacher. Okay, bad comparison, and perhaps too much information. The point is, now and then I’ll play a game that I don’t have much desire to play ever again, but I still can’t help but like it, in its own way. 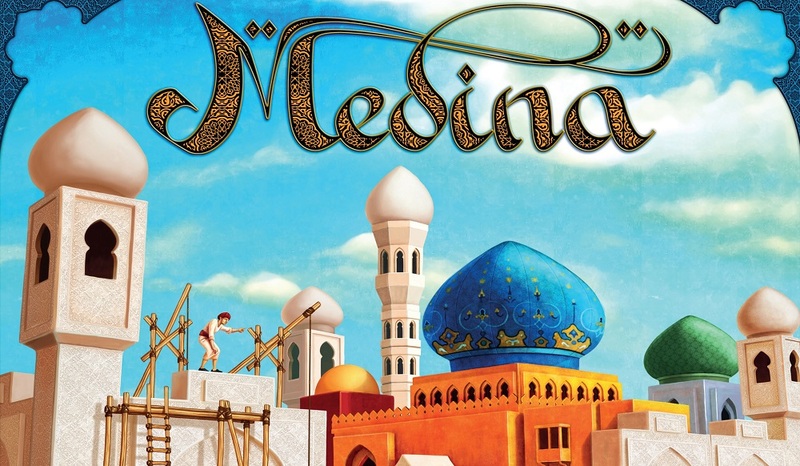 Medina is possibly this year’s most glowing example of that conundrum. In all honesty, I get bored reviewing expansions. As with the assembly of a cloak-seeking photon torpedo, it’s only fun once — which is why, across all of Star Trek’s many series and movies, they only did it the one time. The Federation could have obsoleted cloaking technology altogether, but one man had already boldly gone there before. So today I’m going to rapidly launch a full three expansions reviews out my aft torpedo-tube, which is just one of the many phrases I use to refer to my bum. These are all expansions for games I enjoyed — Core Worlds, Space Cadets: Dice Duel, and Among the Stars — and as happy coincidence would have it, they’re all set in outer space. They’re also all published by Stronghold Games, but that’s not quite as interesting as the first coincidence. Among the Stars seems to have been designed to push nearly every one of my nerd buttons. An alliance of aliens working together? Egalitarian Future Button! Assembling a unique space station? Deep Space Nine Button! Card drafting? Drafting Button! Designed by a dude whose name is so unpronounceable to my thick English tongue that it might as well belong to an alien? Alien Board Game Designers Button!